Lennie's Diary - 1898: Lennie is Not Ready to Marry Alma. She is Too Young. Lennie is Not Ready to Marry Alma. She is Too Young. We continue reading Lennie's diary. Received examination as in fore part of book. Lennie seems indiscriminate (or nondenominational) in his attendance at church events. Last Dec 18 he mentions the "Sweed Xmas tree" which I propose was an event at the either the Swedish Lutheran Church or the Swedish Mission Church. On January 11 he attended a meeting at the "church Christ". And now, here he is, at a youth group event at the Presbyterian church (not a vintage photo). It is at the Presbyterian Church that Lennie and his future wife, Alma, will raise their three children. But those days are still long in the future. 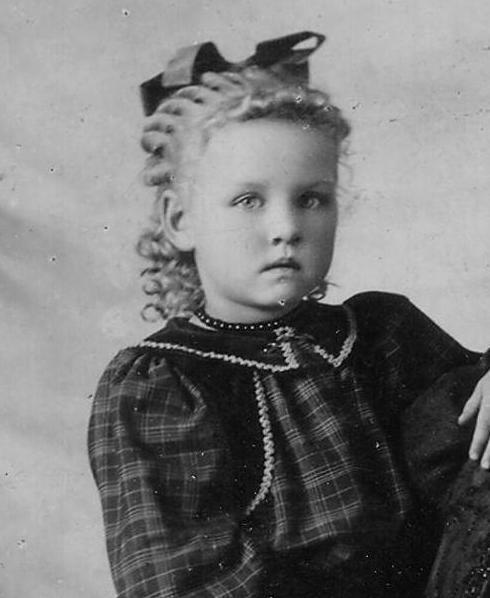 Alma today, January 1898, is only five and a half years old. She is living in Wisner, Nebraska, with her parents. Her maternal uncle, Charles Schulz, is brother-in-law to Lennie. If you go back to this post you will see Charles when he played with the Wakefield Cornet Band. You will also see what I believe may be the wedding photo of Charles and Ollie (Olive is Lennie's sister). They've been married three years but their first born will not appear until 1899. It is possible that at this time Lennie has not yet met Charlie's niece, Alma. As we read his diary for the rest of the year we will see that Lennie is interested in walking many girls home from church or youth group. But none of them is 5-year-old Alma. This is Alma in about 1898. Alma's life was to have many tragic events but her marriage to Lennie and subsequent family of three children were surely happy days. LOL, it sounds as if wife-hunting was one of the motives for Lenny's church hopping (guys in any era like to scope out the girls). If Alma were 17 when they married, Lenny would be thirty, or close to it? Wasn't that oldish for a young man to marry back then?